Molgrom Twice-Killed is a Nord thief and a member of the Thieves Guild. 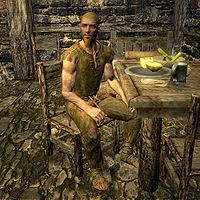 He is currently in Riften Jail, a punishment from Brynjolf who disapproved of his methods. He wears only a roughspun tunic and a pair of footwraps. Twice-Killed is a self-given name despite the fact that he hasn't even been killed once. He started using the title after a night out a few years ago when he was trying to get Vex drunk at the Ragged Flagon. He was stabbed after telling someone who was making too much racket to keep it down, but Vex saved him. When approached, Molgrom will be dismissive of you, saying things like: "What? What are you looking at? ", "Get away from me. ", or "Piss off. I'm busy." He will only be available for dialogue if you are a member of the Thieves Guild, in which case he will instead greet you with complaints: "Brynjolf sent you to rub it in? ", "Waste of talent throwing me in here, right? ", or "Can't wait to get out of here." Upon exiting dialogue, he will tell you either: "You didn't need to leave so soon." or "Give Vex a kiss for me." You can inquire with Molgrom about his name. He will tell you, "Got into a scrap a few years ago at the Ragged Flagon. Some idiot who stole himself a guard's sword and kept boasting about it. He's making too much racket and I'm trying to get Vex drunk. So I tell him to keep it down and he just runs me through." He will obviously confirm that he lived, continuing with: "Yeah, I was lucky though. After Vex tore the guy to pieces, she gave me a potion. If she hadn't of [sic] been there... Anyway, after I got back to the Guild, I decided to start calling myself Twice-Killed." You can state that he wasn't killed, not even once, which will have him argue, "Yeah, but Twice-Killed has more of a ring to it!" and end with an obnoxious chuckle. You can also ask him why he is in prison, and he'll reply, "Because big, bad Brynjolf doesn't like the way I play thief. Look, he says we needed coin, so I got coin. Who cares if people got hurt? Blood washes off septims. Now I'm sitting in here counting skeever droppings while he's drinking Black-Briar mead with Maven." Should he be asked if prison is a Guild punishment, Molgrom will tell you about Maven's relations and how she gains unofficial authority from it: "Hey, if you're in good with Maven you've pretty much got it made. She's got friends in high places, and I don't just mean in Skyrim. So getting the guards to throw me in here as a 'punishment' was about as easy as falling off a log." This page was last modified on 14 August 2013, at 23:04.